The Current State of Things…. As we head into a new month, we would like to update you on where our inventory stands. As many (if not all) of you know, January was a difficult month for us. 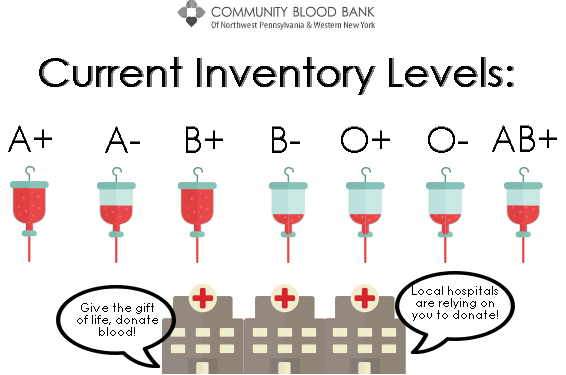 We had lower than average donor turnout across all of our regions, and experienced higher than usual usage from several of our partner hospitals. While we appreciate your patience regarding all of our emails, texts and calls and thank you for taking the time to respond to our pleas, the battle isn’t over yet. As you can see below, our inventory is still not stable so your donations are still needed through this month! Interested in staying in touch with CBB? Update your email preferences in the Communication tab of your donor portal, follow us on social media and opt-in to receive texts from us! You can opt-in by texting BLOOD to 444-999. You’ll earn 50 points toward the CBB point store when you opt-in! And if you’ve opted in since Sept. 18, you’ll automatically receive 50 points too! 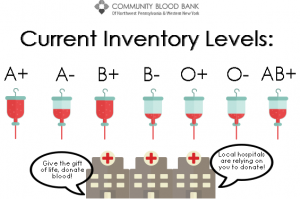 As we mentioned last month, the Community Blood Bank will once again be participating in the Highmark Walk for a Healthy Community! Team and walker registration opens tomorrow, February 1st and is accessible at http://hcf.convio.net/communitybloodbank. Last year was our first year participating in the walk and our generous supporters helped us raise more than $5,700 toward the purchase of an additional bloodmobile so we can reach even more donors in Northwest PA & Western NY! So, keep your eye out for emails regarding this year’s fundraising events, walk details and challenges! Congratulations to Kerry McDaid, the winner of our $100 gift card in December! Interested in winning? One winner is selected at random from our point store drawing each month, you can enter as many times as you’d like each month OR you can redeem your points for something tangible like a coffee mug, t-shirt, or gift card. Your points are yours to use as you’d like. You’re familiar with our ever-changing inventory of gift cards, and by now you probably have at least one mug and several t-shirts. In an effort to keep the Point Store interesting, we will be adding new items throughout the year. Have an idea for something you’d like to see? Email nicole.hornaman@fourhearts.org by Saturday, February 11th to have your idea considered!